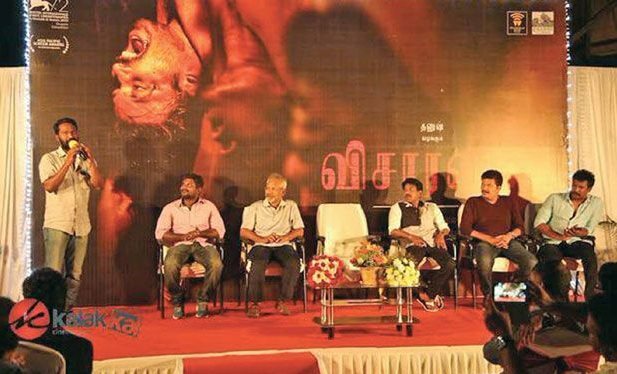 Top filmmakers of Tamil cinema came together recently, to honour their counterpart Vetrimaaran for a great show in ‘Visaranai’, which has been winning accolades world over. The function was organised by Mysskin, who was bowled over after watching the movie. Leading directors Shankar, Bala, Mani Ratnam, KV Anand, Lingusamy, Mohan Raja, Balaji Sakthivel, Sasi, Samuthirakani, Mysskin and Ram among others were present and felicitated filmmaker Vetrimaran. The realistic flick was earlier screened at the 72nd International Film Festival of Venice and it bagged an award under the title, Amnesty International Italy’s ‘Cinema for Human Rights’. An official statement form Amnesty International Italy has said that ‘Visaranai’ has dealt the various aspects of human right with sensitivity.